I have a great DSLR Canon that I love but I also take so many photos on my phone. It's the convenience of always having it with me in my purse mixed with my obsession of uploading everything to instagram that gets me. I do need to get better about taking my nice camera with me more on the weekends or when we're out with friends because it does require practice to take high-quality photos and there's no doubt that the ones I take with my DSLR are always the most clear, crisp photos I've ever seen. But on the other hand, there are certain instances where taking a picture on my phone is just fine and I have found a few apps that I love for editing photos on my iPhone. + PicFlow : This is the best app to use if you want to put together a short, photo slideshow with corresponding music and post to social media. + VSCOcam : This is my absolute favorite one and I think I now use it on every single photo before uploading to instagram. It allows you to edit in any way you could possibly imagine, crop, straighten, apply filters, and export straight to your camera roll or any form of social media. I think I maybe had to purchase this one in the app store but if I did it was definitely worth it. I use this app for all editing I do on my phone and use its filters, rather than the ones I used to use in the instagram app. + Afterlight : Afterlight allows you to add an overlay shape, or in other words "crop" your photo into a shape. For example, upload a photo and crop it to be circular, triangular, or in the shape of an A, just to name a few. It also has a few editing features but I prefer to edit my photo in a different app before cropping in this one. + Over : Ever wondered how people add artwork or text on top of their photo before posting? This app allows you to do both. There are quite a few free artwork and font choices and additional options of each are available for purchase. You can easily change the color or size of whatever you choose to put over your photo before saving it to your camera roll with just one tap. + XnView Fx and Camera+: Again, these are 2 apps whose main focus is editing, rather than overlays or special shapes. They offer multiple editing options like soft focus, blur, color changes, or frame options that are fun to play around with. I include them because they both definitely offer editing options that I have never found in other apps, but they are not apps that I use on a daily basis. + InstaSize : I included this one in case there was anyone else out there that didn't know about it. For the longest time I always wondered how people were posting photos to instagram that weren't in a square-shape and this app is your answer. It's free and adds a border to 2 opposing sides of your photos - or if you choose white it just looks like you're uploading a picture that is either a tall rectangle or a long rectangle, instead of a perfect square. Or else you can make the sides a color, pattern, or glitter - and who doesn't love glitter?! If you take a look at some of my Instagram photos, you will be able to see many of these apps in use! And feel free to ask any questions you may have. 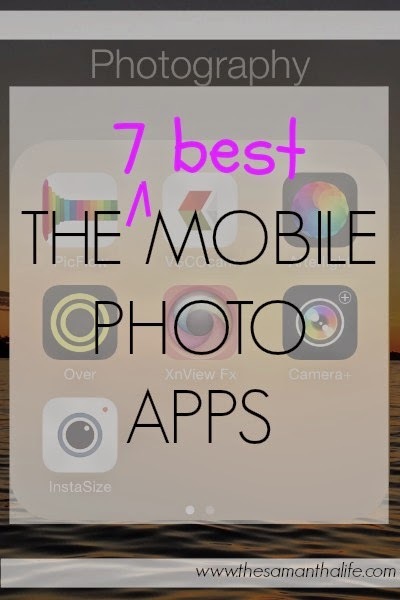 What are your favorite mobile photo apps?